Fancy something operatic but not ready to go the whole Pavarotti? 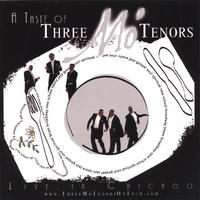 How about three African-American tenors in dinner jackets who are just as happy getting their tonsils round jazz, gospel, soul, spirituals, Broadway and the blues as they are the classical canon? Hitting Edinburgh from Chicago, the show gives a black spin on the Three Tenors format, warming you up with Verdi and Donizetti before hits from Les Mis, Five Guys Named Moe and Ragtime plus tributes to Jelly Roll Morton, Fats Waller and Gladys Knight.